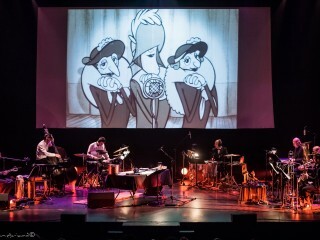 In 2003, the animated French feature The Triplets of Belleville swept the globe, raking up dozens of awards and nominations, not to mention the hearts of countless admirers, along the way. Much of it came down to the Oscar-nominated score by Benoit Charest, which grabbed audiences by the ears and dragged them into the streets of 1920s Paris and Le Jazz Hot. Benoit is back; with Le Terrible Orchestre de Belleville he recreates live the original score as the film itself is beamed onto the big screen. Saddle up for the misadventures of a kidnapped Tour de France cyclist, his would-be rescuer grandmother and the titular trio of larger-than life divas, all accompanied by the speakeasy slick sounds of un orchestre sans pareil onto the big screen.